So, if you follow me on Instagram or Facebook (and if not, why not?) you’ll have seen that I’ve been trying out natural plant dyes. And it’s been really good fun. There is something amazing about watching the dye seep out of plant matter and then see it transfer onto your wool. I’ve tried to do this before – without much success but following a chat with Rita from Hedgeknits at Flockfest, I decided to give it another go. Rita recommended I buy some litmus papers so I could test the pH of my tap water. We live in a hardish water area and have a water softener and it hadn’t occurred to me this would have an impact on my dyeing result, but, low and behold, it did. So, for most plant based dyes, a gentle alkaline medium is best. If I’ve totally thrown you by that statement, panic not! Your water can be made acidic, neutral or alkaline, depending on what is added to it. So first up, fill a pan with water and test it with litmus paper. Litmus paper comes in little strips and you simply dip a strip in your water and it changes colour to tell you the pH. You compare the colour to the chart that comes with the papers. My litmus paper was yellow (it comes in other colours) and so, yellow is neutral, orange through to red is acidic, and green through to blue is alkaline. You are aiming for mid green. Now it’s time to raid the larder. If your water is acidic or neutral, you’ll need to add bicarbonate of soda to make it more alkaline. If its much too alkaline, then you need to add white vinegar or citric acid, to bring it back more towards neutral. My water is only very slightly alkaline and this probably accounted for my previous natural dyeing failures, so I added some bicarbonate of soda, a spoonful at a time, testing after each spoonful, until I got a good green on the litmus paper. Once you have a gentle alkaline ph, pop in your plant material. In my case, I used avocado pits and skins. I’d been saving these up for a while – each time we ate an avocado, I’d wash the stone and skins in cold water to get any remaining flesh off , leave them to dry, split the stone with a heavy sharp knife (keeping fingers and thumbs well out of way) and then pop it all in the freezer. Once I had the stones and skins of 6 or 7 avocados, and was ready to dye, I took the box out of the freezer to defrost. Once defrosted, I added the stones and skins to my water and gently heated it on the hob. Pretty quickly the stones began to exude the most gorgeous pink colouring. I simmered the mixture for about 20 minutes, then left it for a couple of hours to cool. Then I strained the dye solution, discarded the stone and pits and put the dye solution back in the pan. Meanwhile I soaked my wool in some more water until it was thoroughly saturated. I also soaked some wool in some water with added bicarbonate of soda (remember my tap water isn’t very alkaline) and this did result in a slightly stronger uptake of colour. The very great advantage with dyeing with avocados is that you don’t need to mordant your fibre before you dye. This is because are high in tannin. A mordant is just a chemical agent that helps the dye stick to the fibre. To dye, I simply placed the wool into the pan containing the dye solution (making sure there was enough liquid to cover the wool), gently heated again to simmering point, turn off the heat and leave to cool (leave over night for a deeper colour, if you have the patience), rinse the wool and Voilà! After my avocado success, I repeated the process with dock leaves. These produce the most wonderful bright yellows through to golden browns depending on heat, pH and whether or not I’d mordanted the wool with alum or just soaked it in water. 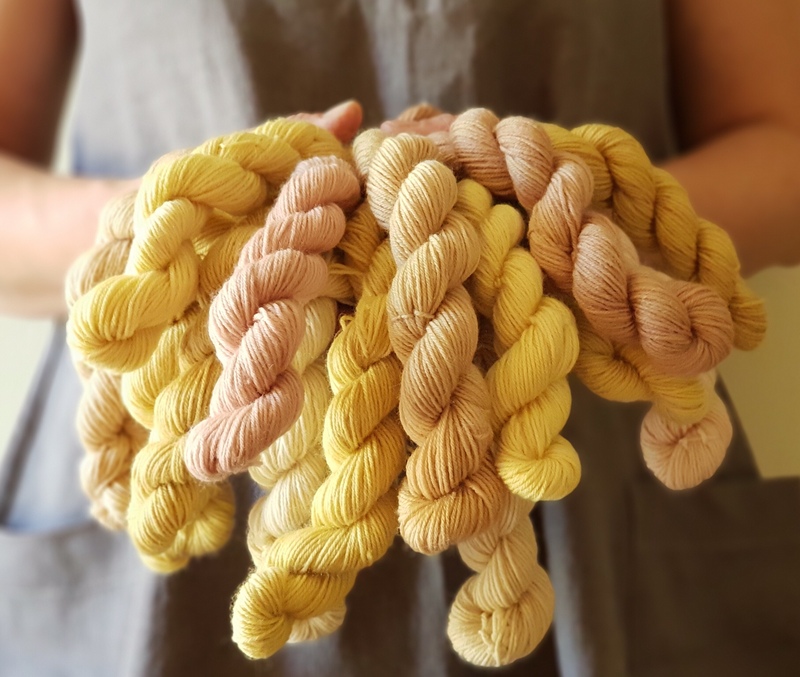 I’d say a willingness to experiment and allowing in some serendipity – not having a shade or tone fixed in your mind – are key to successful natural dyeing. It’s better to love what you produce rather than feel dissatisfied when your results don’t match your expectations. There is also a beautiful subtle quality to the colour of naturally dyed yarn. Because the tone is generally more muted than those produced from acid dyeing with synthetic dye (see my blog post here about starting to acid dye) they seem to naturally co-ordinate with each other. I can see that there will be lots more natural dyeing in my future. I think I’ll try nettles next (but I need rubber gloves and some copper sulphate first), then coffee, rose, and onion skins, and lots, lots more!